Off the eastern coast of Mexico’s Yucatan Peninsula is the Caribbean Island of Cozumel; one of our ports of call on while sailing the Disney Fantasy. Although this wasn’t my first time visiting Mexico, I had only visited Baja California and the Mexican Riviera before this trip and I was so excited to see the cultural and historical sites of the Yucatan. I love history and the ancient Mayan have always fascinated me. 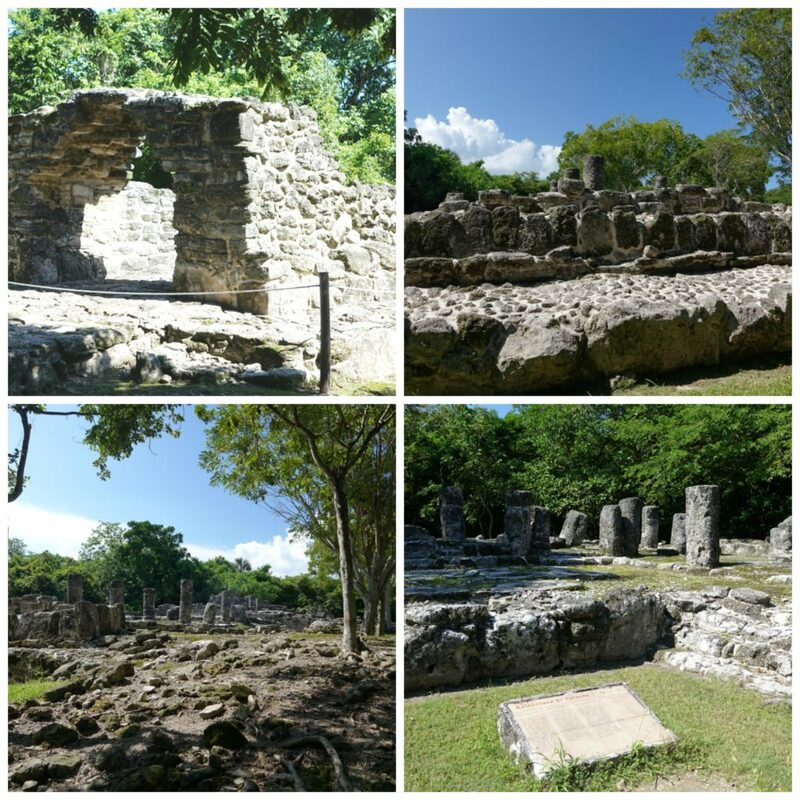 So, when I had the opportunity to travel to this area of Mexico, a trek to the Mayan ruins was a must for us. However, when you are on a cruise you don’t get more than a day to explore, but we picked a tour that would maximizes our time and allow us to see some important points of interest. It goes to show you that you don’t need a lot of time to get the most out of a destination. 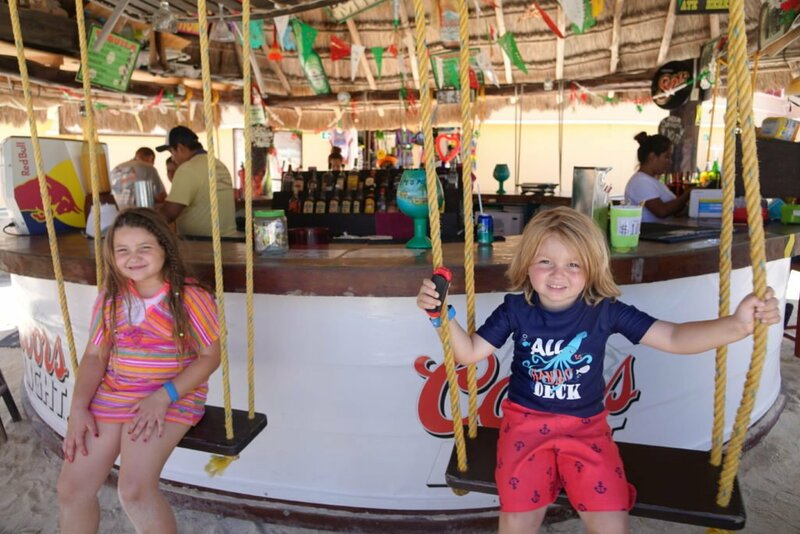 So, without further adieu, here is how to spend one day in Cozumel with kids. When many think of Mayan ruins, Chichen Itza is the first thing that comes to mind. Honestly, I really wanted to visit Chichen Itza too. 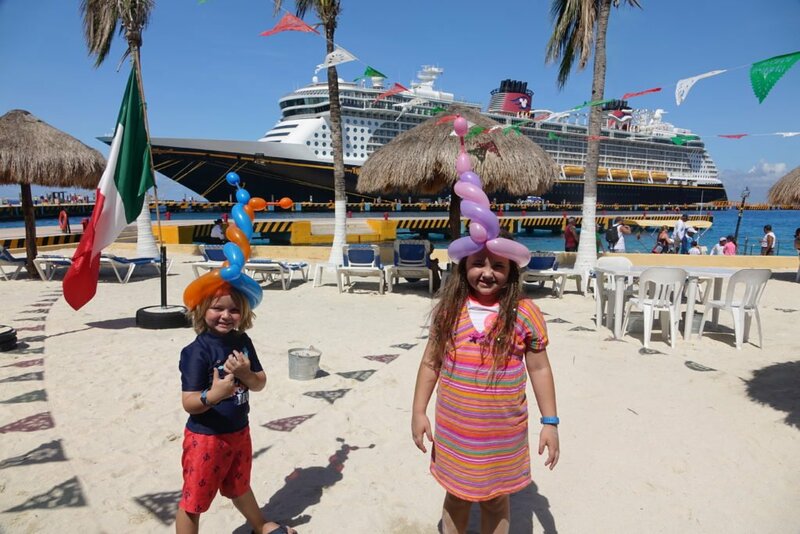 Although Disney Cruise Line offers tours that will take you there, they are long and much of the time is spent traveling there and back. 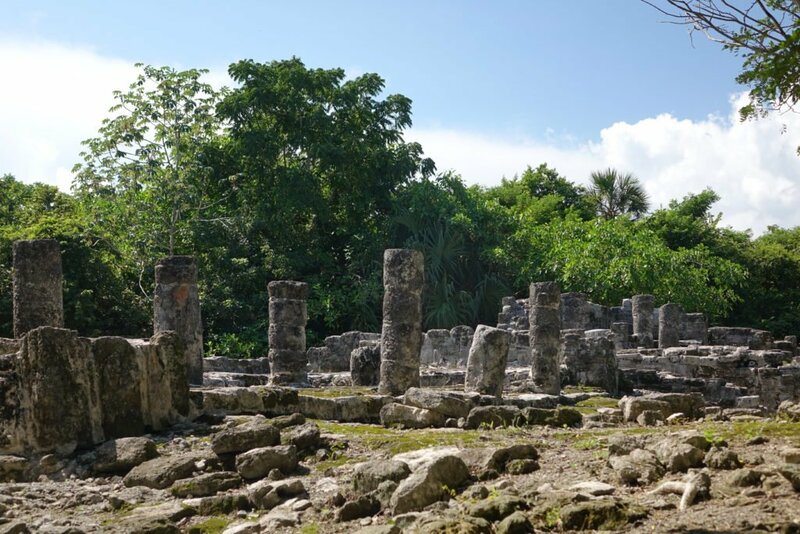 I wanted to maximize my time in Cozumel and opted for the lesser known Mayan site of San Gervasio, since it was located in the island. By not having to catch a ferry to the mainland we saved all that travel time for more exploring. Despite it not being as famous to the mass public as some larger sites, San Gervasio is the only official archaeological site on the island as well as the largest and most important. 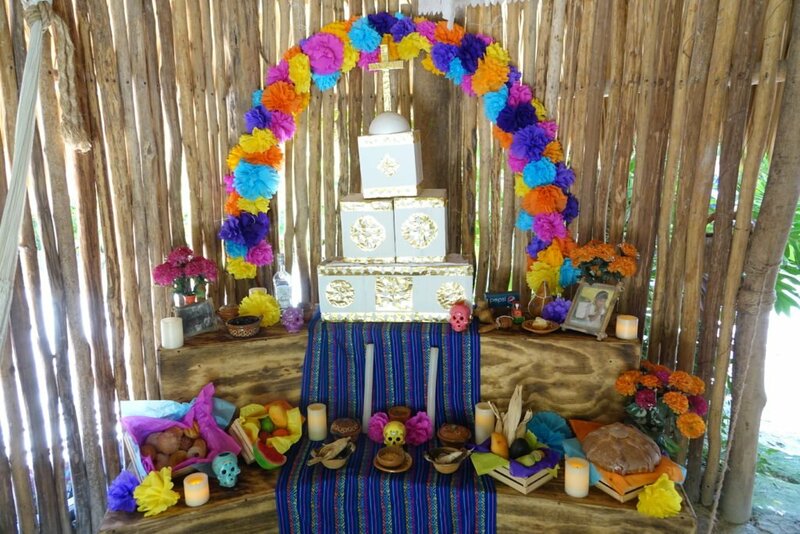 It was also very important to the Mayans too as it was a sanctuary to Ixchel, goddess of fertility and love, in which Mayan women had to visit at least once in their life to pay tribute. San Gervasio opens everyday at 8:00am and closes at 3:45pm. If you are going on your own, I would recommend getting there when it opens, because it gets so hot and humid. Our tour got there at 8:00am and it was hot and humid enough as it was! We were dripping. I was so happy to be around ruins and so fascinated by the history that I didn’t care too much, but my son wasn’t too happy as you can see in the photos. HotMamaTip2: Use bug spray or lotion and wear close-toed-shoes! Even if you aren’t worried about the Zika virus, there are bugs everywhere in the humid jungle. Right out the gate, Firecracker manhandled a huge thing that landed on her leg. There are also lots of large bity ants, wear close toed shoes. 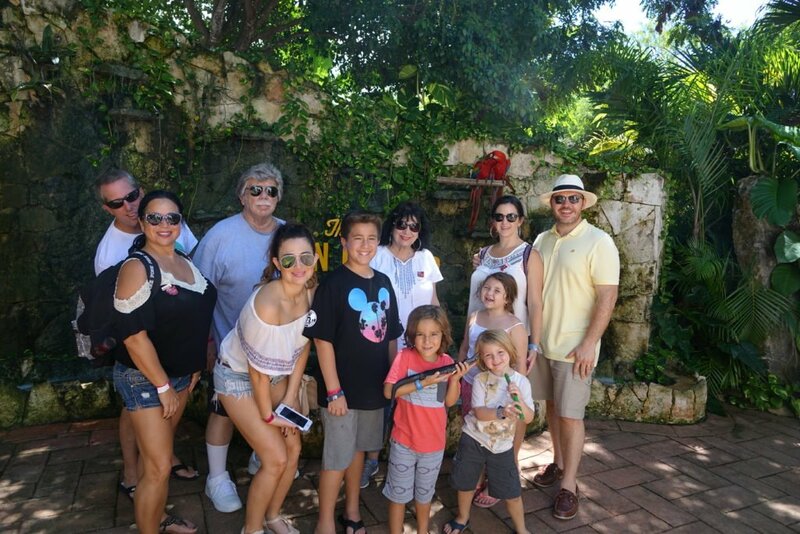 We were all in flip-flops…enough said. If going on a tour, your entrance costs are covered in the cost of the tour. On your own the entrance is a reasonable cost of $4.50 USD for adults and frees for kids 10 and under. You pay $20 for a personal guide or you can tour the site at your leisure. You are free to take as many photos of the site as you like, but if you want to record your experience it will cost you a small fee of $3 USD. Once you pay the fee, you get a green sticker for your video camera and you are good to go. If you get hungry and thirsty after sweating off breakfast, there are snack bars available food beer ice cream and more. The kids got ice cream and I got a cold beer. Cold beer never tasted so good! After exploring some Mayan ruins, we hopped in the van with a couple more cold beers, because we can do that in Mexico, and made our way to the Discover Mexico Cultural Park. We got to walk through the cool air-conditioned museum, taking in the many interesting artifacts from the past and folk art as well as a powerfully exciting video collage. Next, we wandered outside to view the miniatures that walk take you from Mexico’s beginnings to present day. It was really hard for the kids to not want to play with the little figurines. We were starving by this point and gloriously enough there was a delicious and authentic taco buffet to enjoy. Handmade tortillas were being made freshly in front of us as we loaded our plates with juicy meat. My favorite was the Cochinita Pibil, which is a slow-roasted pork dish original to the region. 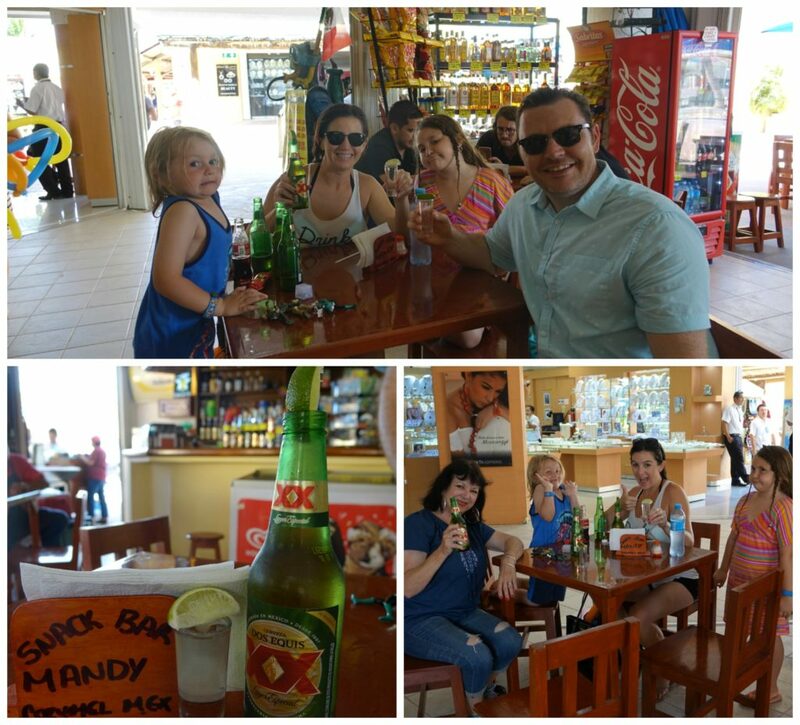 Although the buffet comes with a soda, we washed our tacos down with margaritas and cervezas, of course. I opted for the jumbo rita so I could take home the hand painted margarita glass. The kids got a fun little surprise while we were at the cultural park. After lunch they dropped a piñata for the kids to hit. Once it busted open, it was a frenzied rush for all the delicious Mexican candy. This experienced was included in the cost of our tour, but if you are traveling independently there are a number of experiences you have available to purchase. 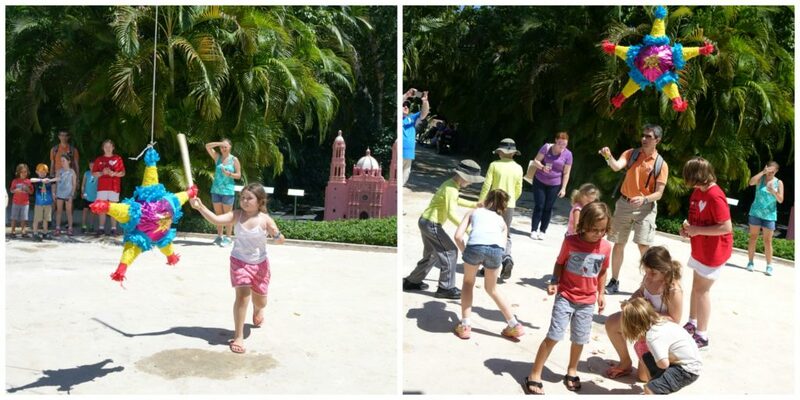 What we did was the Mexico Past to Present experience, which costs $26 USD for adults and $19 USD for kids. This cost does not include the buffet or tips. 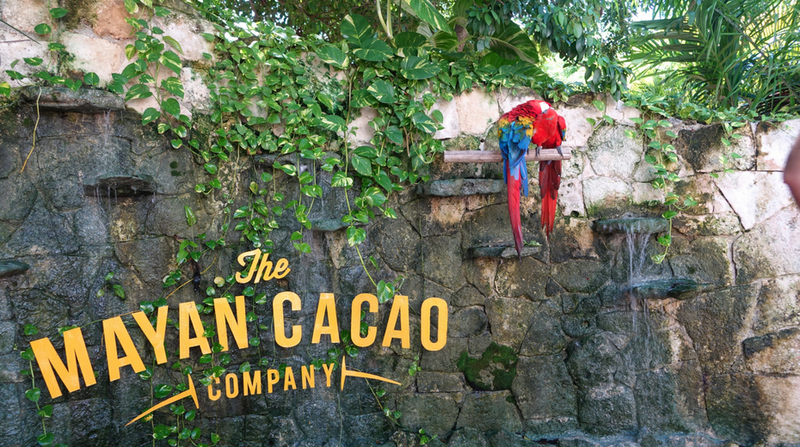 Upon arrival at the Mayan Cacao Company we met some tropical parrots and learned how cacao seeds were first brought to this area of Mexico through bird droppings! Appetizing right? 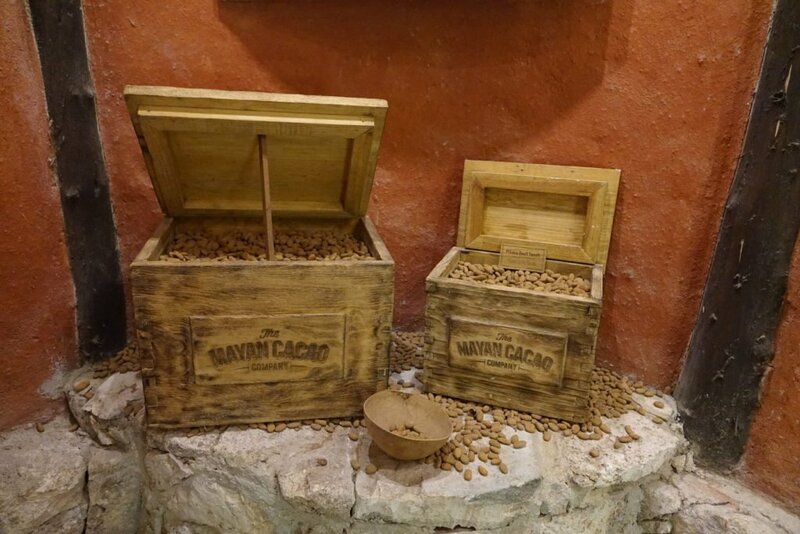 The gallery is where you’ll learn more about the history of cocoa. The beans were so valuable that the Mayan’s actually used them as currency and how the chocolate was only drank by Priests and royality. 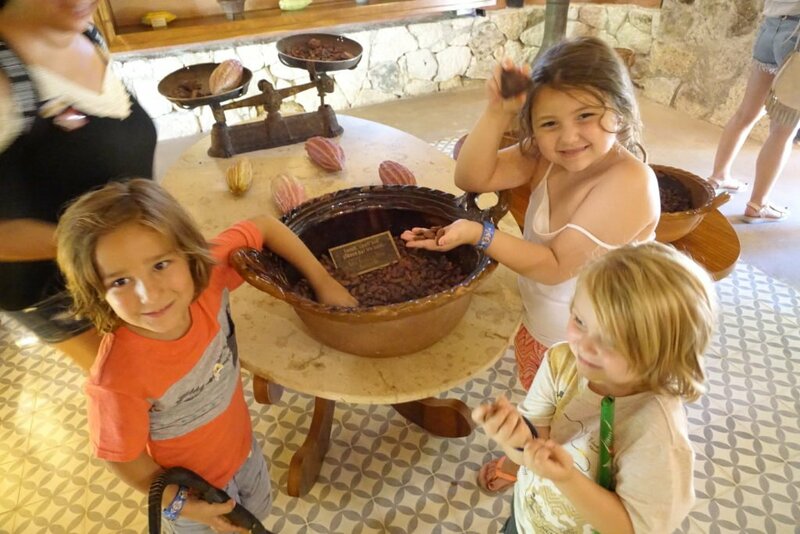 The kids loved seeing, touching and smelling the raw cocoa beans. You will also get to watch video to see the entire process of harvesting the beans and how chocolate impacted trade routes. All over the property are Cacao plants for you to view on your way to the Mayan Hut. 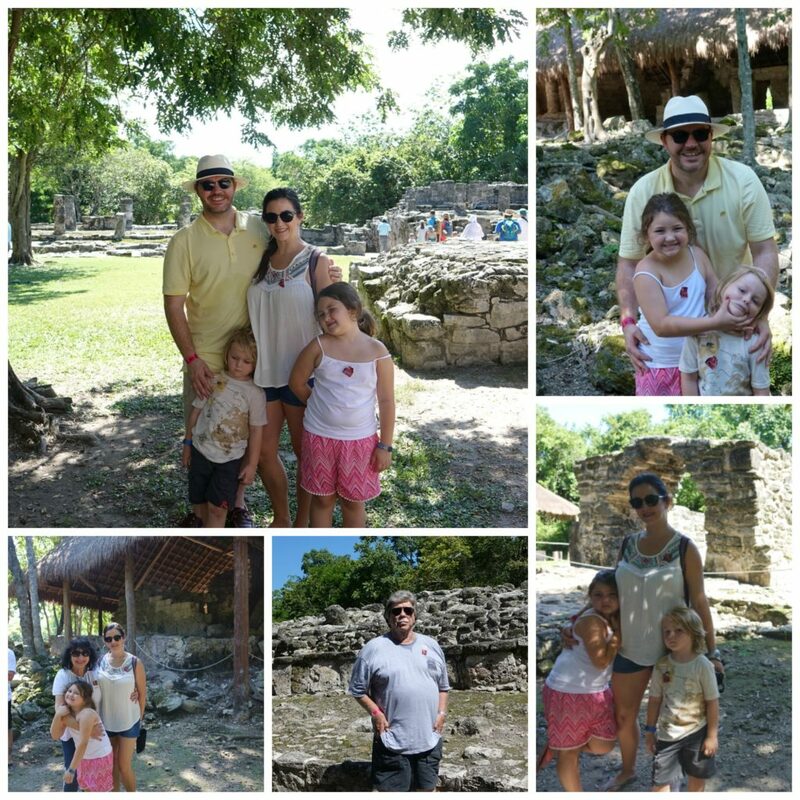 At the hut you get to step back in time to see what everyday life for the Mayans and to learn about their traditions. 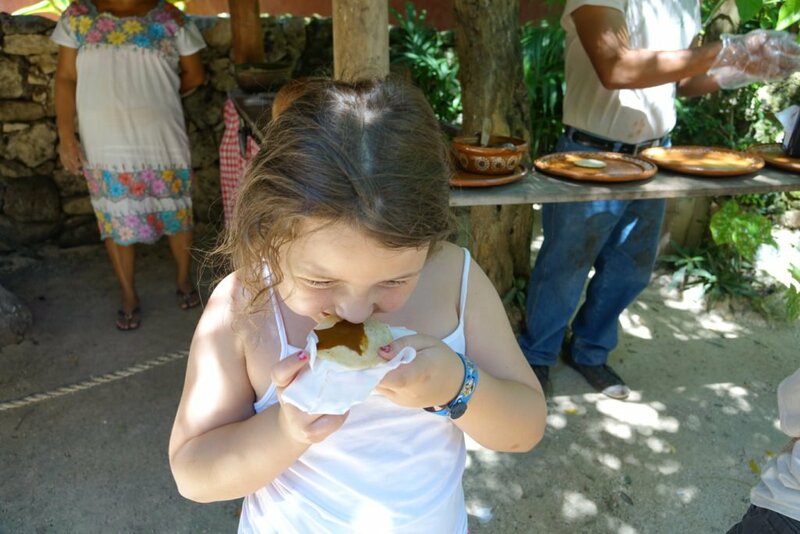 It is at the kitchen that you can sample freshly made tortillas topped with homemade mole, an unsweetened chocolate sauce. CuddleBear wasn’t a fan, but FireCracker liked it. 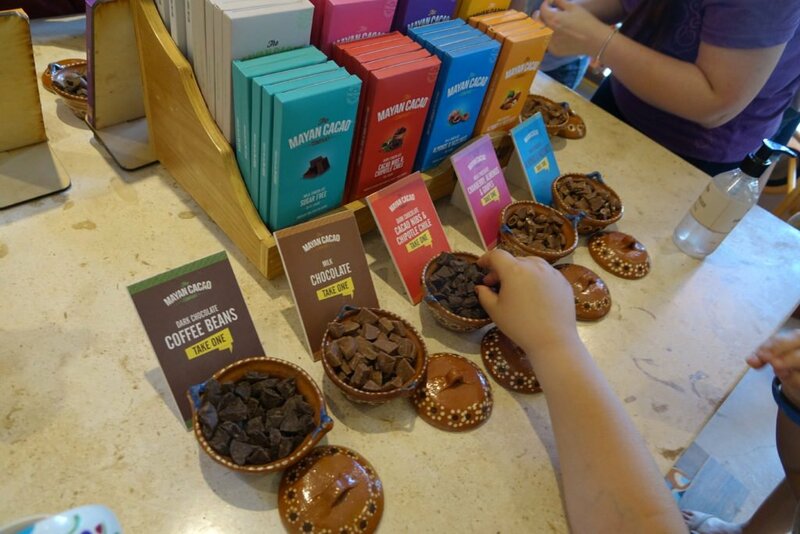 In the gift shop, don’t forget to take some Mayan chocolate home with you. There are so many flavors and happily, they are all out for sampling! Seriously delicious chocolate! You can’t stop eating it. My favorite was the Lime & Coconut bar. I don’t have a sweet tooth, but I could put it down. 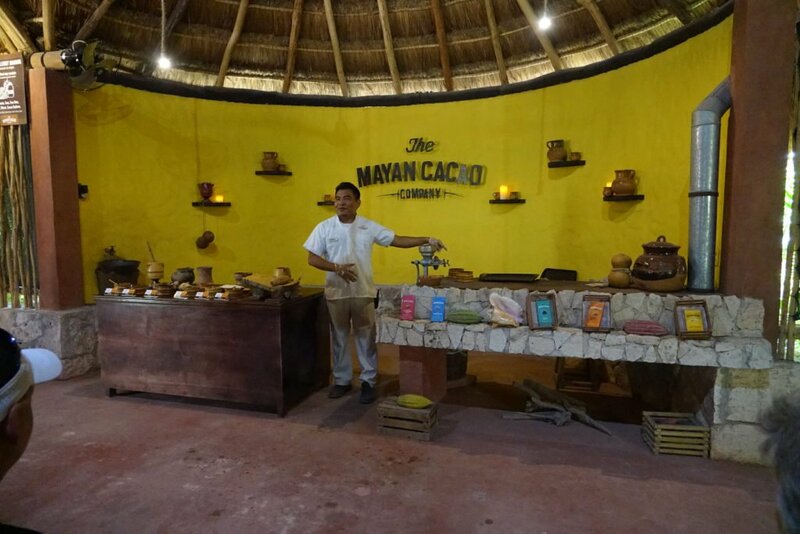 At the Auditorium and Tasting area, you will learn how the ancient Mayans prepared chocolate. At the end of the presentation you able to sample fresh made hot chocolate. The flavor is surprise at first, chalky and unsweetened as it is raw. It was a shocker for my son who had taken a big swig! Outside is a bar of traditional and natural flavorings to add to make your Mayan hot coco especially delicious. Some of the ingredients available to add were honey, vanilla, cinnamon and even chili. For mamas, daddys, and grandparents there is a chocolate bar. Yes, an actual bar with adult chocolate drinks. Literally swing up to the bar top for a delicious and refreshing Mayan Chocolate Pina Colada or Chocolate Margarita. I know the Chocolate Margarita sounds weird, but it was actually amazing! Admission is $15 USD for adults, $9 USD for kids 6 to 12 and kid 5 and under free. Since we were sailing during Hurricane Matthew, we unexpectedly got an extra day in Cozumel. This time I didn’t want to do anything but sit, enjoy the beach and drink. So, if you only have one day and you want to doing. That is doable too. My sister and I decided to split this day as she was looking for a more active experience. 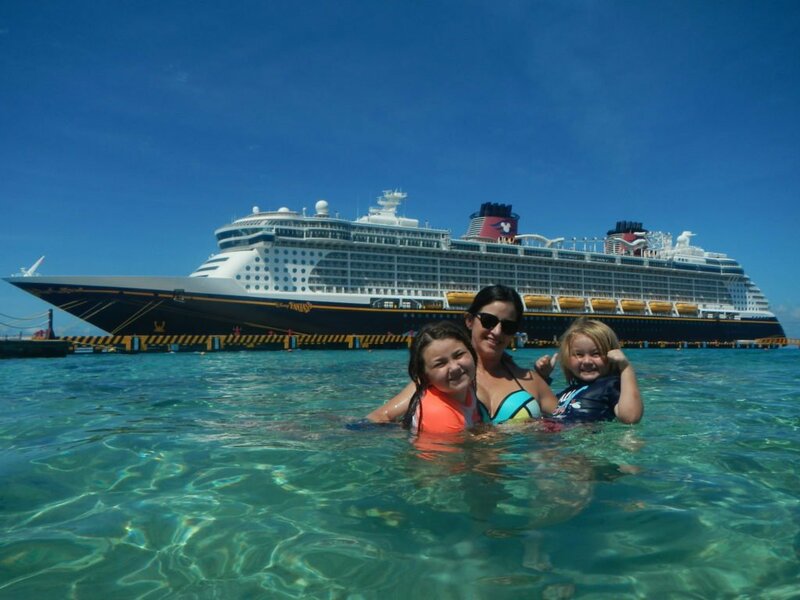 We hung out at the small beach right off the port dock, which was amazing because we could swim, enjoy beers all while in view of our the Disney Fantasy. Alternatively, we could have opted for a day at the San Francisco Beach Club, which sounds super fun in retrospect, but we did end up having a pretty relaxing day, which was nice. My sister decided to take a cab over to Playa Mia for and more wild day on the beach, including a water play zone and tequila tasting. She had a great time too. Whatever your desired experience, it can happen in Cozumel. 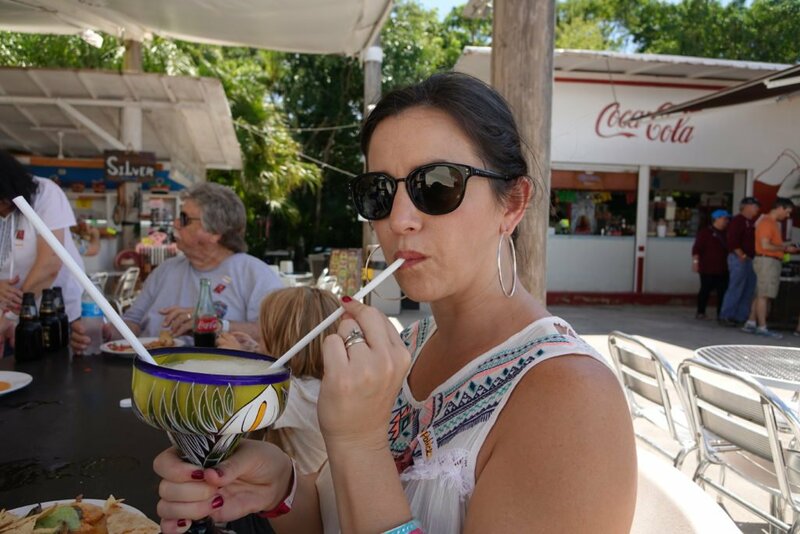 The island of Cozumel has many great places to eat and drink, but we were on a cruise and didn’t want to venture too far from the ship at the end of the day. Here are some fun stops if you are just looking for a good time and good tacos! Located at the end of the cruise terminal off Rafael Avenue, is Pepe’s Pier. This is a great place to make your first beer stop! I like it, because it s a beach bar, so kids can play in the sand while us parents and grandparents enjoy a bucket a beer or two. Located within a tiny strip mall off the Rafael terminal is a tiny little snack bar. First, it bared my name. Second I was need of some tequila and tacos stat. We rolled up all wet and sandy from the beach and enjoyed a few rounds and the most delicious tacos ever! My mouth is watering just thinking about them. Normally, I wouldn’t write about a place that is so touristy, but who doesn’t pop into a senor frogs while in Mexico at least once? Plus, they are everywhere. There is a ½ Senor on the Rafael terminal and a full Senor on Carretera Costera Sur cruise terminal too. Although it is not my favorite place in the world, it does provide a fun atmosphere for everyone and a great place for quick drink and funny pictures. If you are coming into Cozumel via cruise and you want your passport stamped, head to the post office around the corner (literally) from the SenorFrogs on Carretera Costera Sur. It is free and easy. For a small island there is actually quite a lot to do in Cozumel. Whether you want to spend your time exploring history and culture at the Mayan ruins or Discover Mexico Culture Park or snorkeling and enjoying the natural beauty of the beach, or just eating and drinking all day, you can do it in Cozumel. We were only there for one day as it was a port of call during our cruise, which you can read more about HERE, but somehow we still got to experience a lot! Have you ever been to Cozumel? Fun! I don’t have kids, but I’m pretty much a big kid so it’s nice to see things that would probably interest me. I mean who wouldn’t love a chocolate tasting? Right? 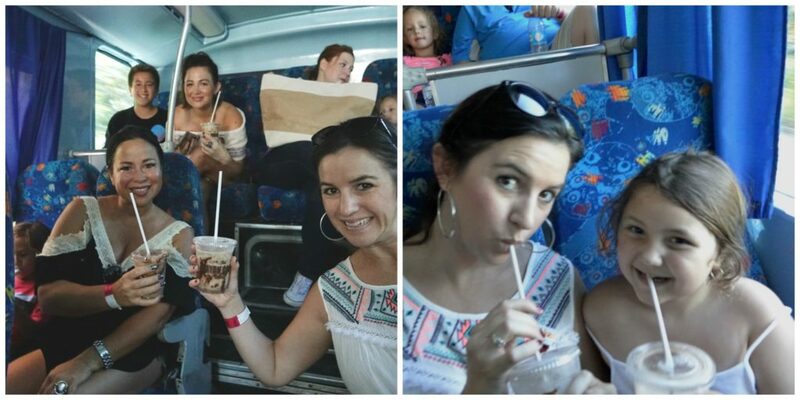 As adult you could you enjoy the chocolate alcohol drinks, so it will probably be more fun for you! 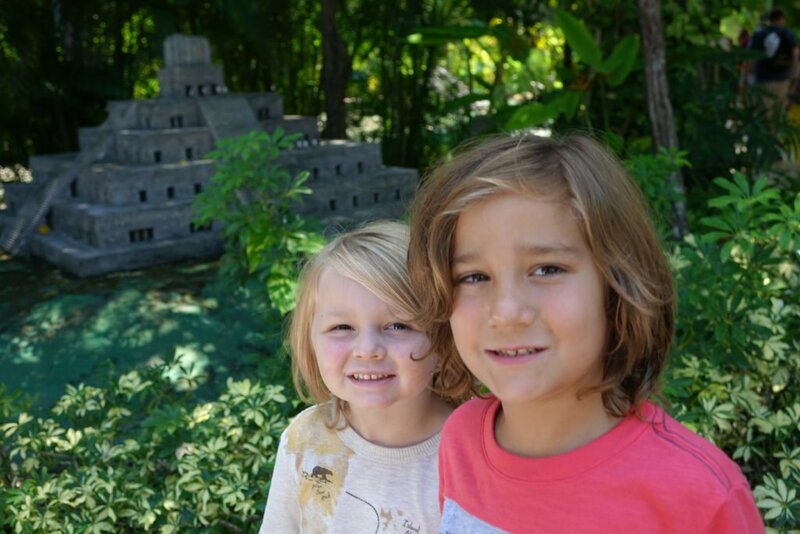 I did Mexico before kids and I was unsure if I would ever feel comfortable taking them. This looks very doable and fun for everyone! Thank you for the information!! My six year old and I are booked for our cruise and I was unsure what excursion would benefit both of us. You sold me! Thanks again !! That’s great to hear! Hope you have a wonderful time!! I think I’d stay eating all the Mayan chocolate in the gift shop and have the staff refill everything all the time! It looks like you had an amazing time. Cozumel looks incredible! We came very close to visiting when we were in Mexico 4 years ago. It looks like we missed out. Glad you took advantage of the day and saw so many cool attractions. It seems like a there is plenty to do and ideal for kids as well! Who wouldn’t enjoy Mayan chocolates! Thanks for sharing. Yes, there is so much to do and so much we didn’t do. The chocolates are a great souvenir, because we are still enjoying them long after the trip. Just by reading the letters of ‘Mayan Chocolate Pina Colada’ I am getting lifted to adult chocolate heaven. Amazing trip. Thanks for sharing! Haha cheers friend! Thanks for reading! Your blog tempted me to visit Mexico. Oh yeah! I glad it did! That was a busy day! But definitely worth it. What great varied activities. The chocolate experience does call to me, but I think I’d have to pick the ruins as my favourite. Yeah the ruins were a must see. They chocolate was just icing on the cake. 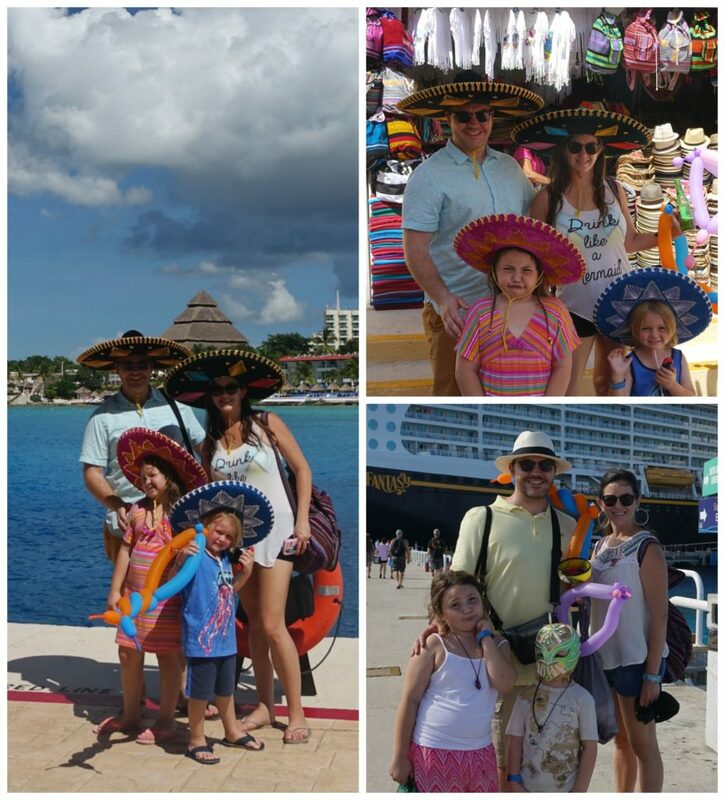 I love Cozumel and I think it’s perfect for a day or two! 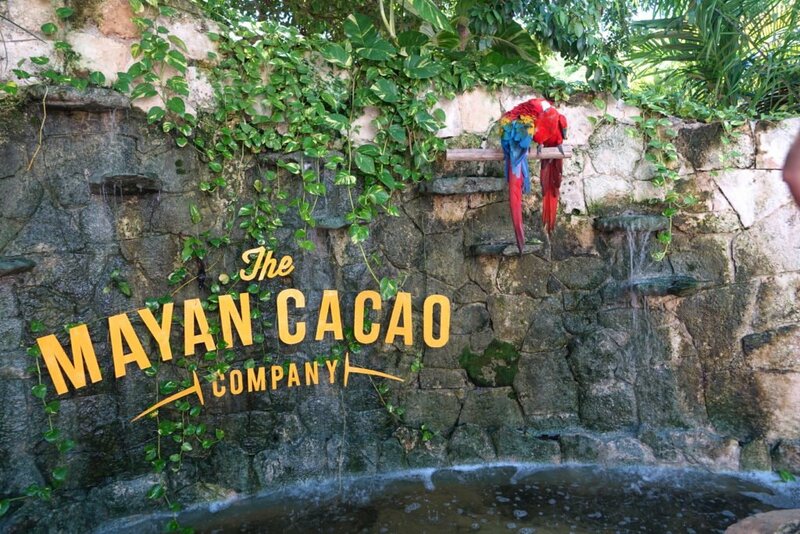 The Mayan Cacao Company looks like a ton of fun, I need to add it to my list. It is a small island so a day or two is perfect, but honestly it was so beautiful we could spend a week there. 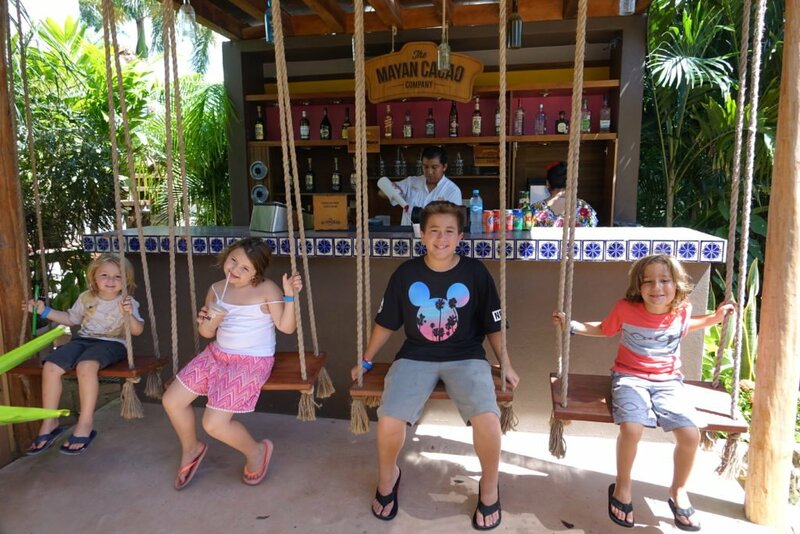 The kids loved the Mayan Cacao Company activity the most…who doesn’t like free chocolate samples!! We love cruising to Mexico. We have a post on how our honeymoon cruise ship caught fire and we got a voucher to go on a future cruise, so we chose to sail the Baja Coast to Cabo, Mazatlan and Puerto Vallarta. That was also a lovely cruise on the Pacific side too! I enjoy reading travel tips from a cruiser’s perspective since I am often in the same boat. (sorry, hehe) We’ve visited Cozumel both ways, staying in a resort for a week and hopping off a cruise ship. Looks like you really maximized your fun on the island! 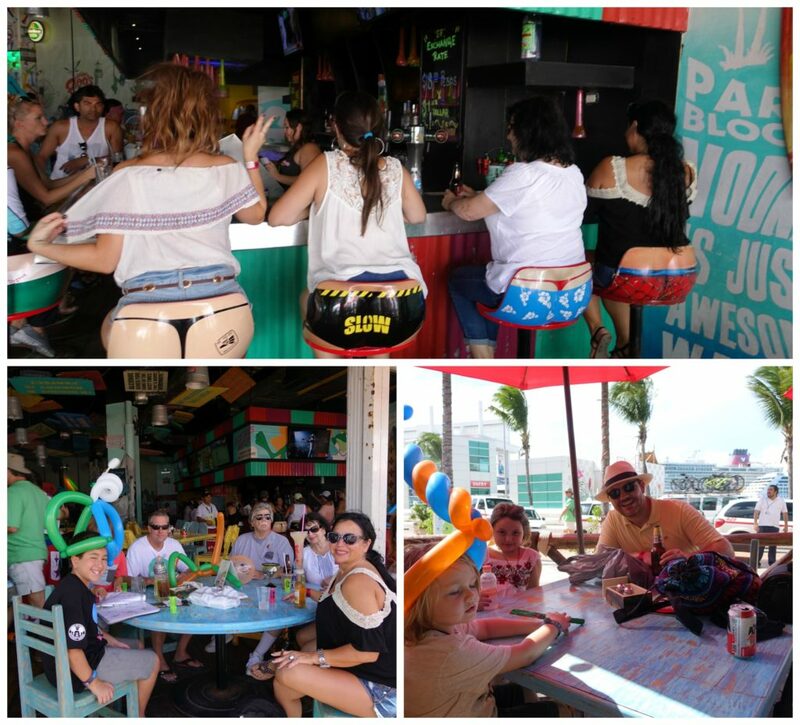 As for Señor Frogs, you are right, it is a fun place with lots of funny and silly decor. I freely admit to downing a few in Señor Frogs! Also, I didn’t know about that chocolate factory you visited, we took our nephews to a different one, Kaokao Chocolate Factory in town. Thanks for sharing this amazing guide. Cozumel is home to some of the most beautiful beaches in the world, including Playa Bonita, Playa El Mirador and Playa de San Martin. One beach that is especially worth visiting is located at Punta Molas on the northeastern tip of the island. Great Post keep sharing.